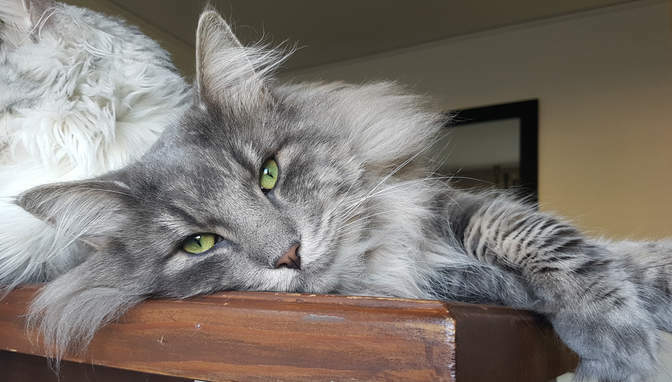 Our goal is to breed healthy, strong built cats according to the FIFé standard of Norwegian forest cats, and the health and temperment is our top priority. The most important for us, is that the cat will be a nice family pet. Our kittens will be used to an ordinary family life, with children in different ages and other cats. All breeding cats will be tested for HCM regular, and are of course tested for GSD IV, PK deficiency (or free-tested by parents), Felv/fiv and Strep G. Our studs have a 6 month NUA test to insure they are certified breeding males with decended testicles and no imbilical hernias. Our cattery is yearly tested for Tritrichimomas, Giardia and Coccodia to insure ongoing health in the cattery. Fully vaccinated against cat pest and cat runny nose dvs. 2 ggr. Health-certitficate (not older than 7 days). When we sell a kitten we work with our SVERAK contract in which the rights and obligations of both the breeder and the new owner are included. This contract can be obtained in advance from us. We only sell a kitten after a personal meeting if possible and only to people seriously interested we feel appropriate for our kittens. For persons buying a kitten outside of Sweden I ask for a few skype/Facetime and phone calls so I can personally meet you first beforehand. I also ask that you either come to Sweden directly to pick up your kitten or that you will fly me to your country to deliver your kitten. I have not feel comfortable to send a kitten to a country alone so far in cargo. I would consider to do so but only through an accredited Transportation Company. Our kittens grow up in a familiar atmosphere, with a lot of attention, care and love. This makes them social and well balanced animals. Our kittens can not walk freely outside. If you have a outdoor catrun/enclosed area that is fenced in for your cat it is great. Also a leash. For our kittens we are looking for homes that have a garden / run or other type of defined area where they can play. Our Norwegians are very social and we find it very important to have a roommate that can be another cat, dog or person! Remember when you buy a kitten they like to climb and need climbers to do so. There are obligations you have to consider before making this purchase: Insurance, Food, Time, Old age. You are welcome to contact us, if you are interested in buying a kitten from SE*Ullrtass´s. Email is always a great first contact for me.